EXCERTPS FROM “AFTER THE BALL”, THE GAY MANIFESTO. The manipulation of the population by the “Gay Agenda” has been masterful. 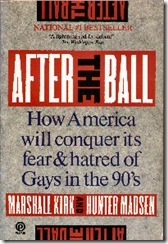 The current campaign started in 1989 with the book within the homosexual community called: “After the Ball: How America Will Conquer Its Fear and Hatred of Gays in the 1990s” by Marshall Kirk and Hunter Madsen. Their strategy has worked because it has conditioned many of you, yes you, like a dog is conditioned with a bell to see homosexuality as been benign, and their dysfunctional mental condition as being equal to a civil right issue instead of a set of detrimental behaviors by some mentally sick individuals. Here are some of the manipulations of the Gay Mafia in their own words as they appear in their "After the Ball" manifesto, their strategy for brainwashing and manipulation of the masses, and what you have been made to believe and what you have been lead to think about what homosexuality is and is not. These are a few samples of the Gay Mafia OWN tactics and their OWN manipulations and slogans to convert you, to make you believe their political agenda. Well... do YOU like to be manipulated? Read and wake up! 23) Heterosexuals are like Aryans and people who are against homosexual behavior are “Nazis” and “Clansman”. 26) All scientific/medical arguments to prevent 1973 APA/AMA removal from disorder list were rooted in cultural prejudice, medieval knowledge of science/medicine, and misinformation. YOU have been manipulated like a dog...! YOU have been made to see homosexuals as victims of society intransigence and intolerance instead of what they REALLY are people with a pathological condition…! YOU have been lied to…! READ the Book “What Nature Intended”, all of it, and yes even GRAPHIC Chapter 5 and get informed into what homosexuality REALLY is…. a sickness!